Am I the only one that immediately thinks of Anchorman when I hear of a dog named Baxter? Ok, so maybe you did not like the movie, maybe you did not see it, but those of you that did will understand how hard it is to hear Baxter and not think of Will Ferrell’s trusty dog. I could not see Will carrying Baxter around in a pet carrier, but I know many people love to keep their pets with them at all times. 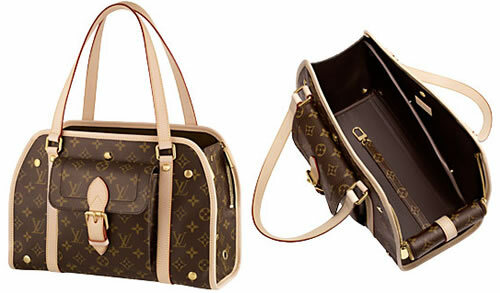 Jessica Simpson has been one of the leading ladies seen carrying her pup Daisy in Louis Vuitton dog carrier. Now there is a new version released by Louis Vuitton, the Louis Vuitton Monogram Canvas Sac Baxter PM which is designed with monogram canvas and trimmed with natural cowhide. This dog carrier looks more like a handbag from the front, sporting a flapped pouch pocket with polished golden brass hardware. 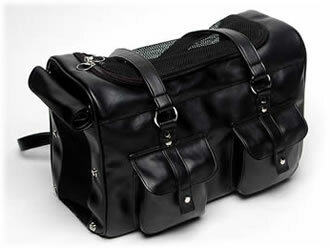 The side panel unzips, folds over, and secures with snaps to give the perfect luxury room away from home for your pet. Measurements are 13.8″x 10.4″x 6.5″. I have only had one dog in my life, and he is a black lab who can not fit in a dog carrier. 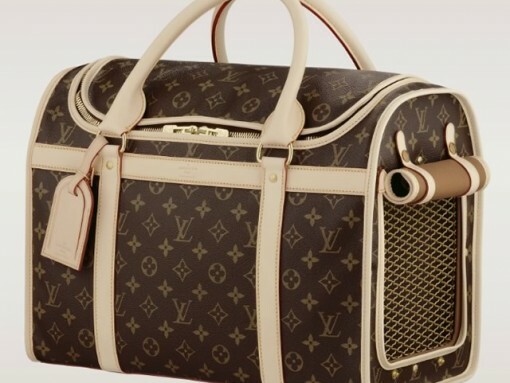 I am not sure that if I had a small dog I would take him/her around with me everywhere, but this is a great option for the owner who loves luxury and their pup. Buy through eLuxury for $1360. The phrase ‘zoned out’ can be personified with Ashlee Simpson. New nose, makes new face, makes new ego, makes new ‘zoned out’ empty Simpson sister. Ashlee does love her pet though and sports her pup in an UGG Dog Carrier. 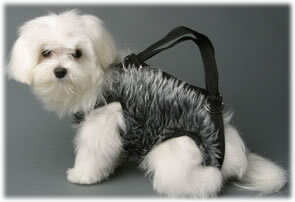 The UGG Dog Carrier is made of plush shearling and features rubber mesh on the front, back, and top for fresh air. Practical with tons of storage space and the option of two carrying handles or an adjustable shoulder strap, this pet carrier can keep your best friend riding in style. While Ashlee really does look empty in the picture, I must applaud her choice of pet carrier for not being too expensive for an animal that has the option to go potty in the bag. Buy it through Amazon for $260. Finishing off the day of man and woman’s best friend, is a pup accessory by high end designer Gucci. 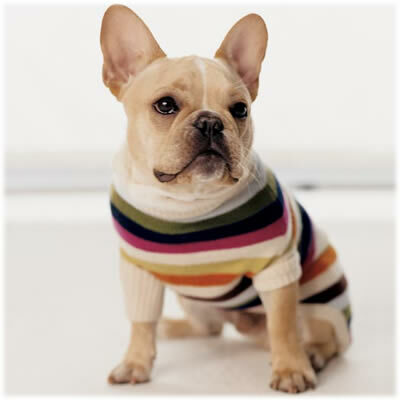 Gucci may be known for their designer bags, elegant gowns, and comfy shoes, but their pet department is growing. After visiting their boutique in NYC over the weekend, I realized they really do love pet accessories (many are so pointless- like a pet sun visor!). But different strokes for different folks. If you love it and you can afford it, why not. 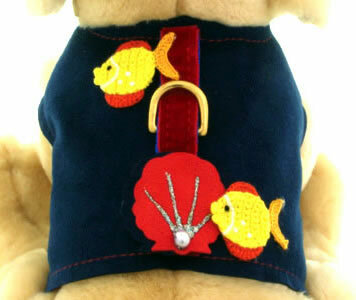 While pricey for a drooling animal that sniffs other’s rears, the Gucci Dog Pendants are chic and shiny. On the left we have my favorite, the Gucci Heart and Dog Bone Pendant. This pendant is a heart shape made of nickel-plated brass and has a red (enamel) bone going through the middle. Buy it through Gucci for $90. And on the right we have the pendant that makes me laugh at the ridiculous engraving. 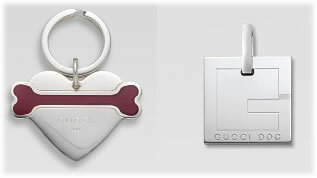 The Gucci Square G Dog Pendant is made of sterling silver and has “Gucci dog” inscribed. Umm… that is soooo not me or my family or my dog or my great-great-grandchildren’s dog. If someone lost their dog and it was wearing that tag and I found it, I would have to laugh for an insane amount of time. But maybe you dig it. 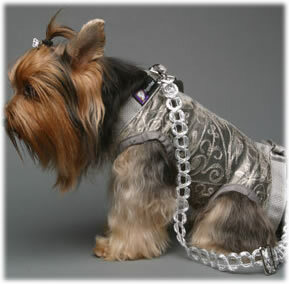 If so it is available for a Gucci price for your indulged Gucci dog through Gucci for $185. I am realizing one thing today; I am leaving out any animal that does not bark (with the exception of barking parrots, cats, fish, snakes, mice, ants, etc). So for all of you non-doggie animal owners: send me anything you would like me to cover for your precious pet! 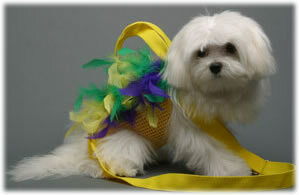 Some dog owners are not big into glitz, glam and costumes. Take my family for example and the recent Dog Star Nitro. 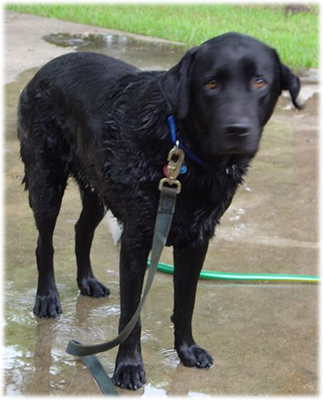 Nitro is just a regular black lab. He fits into that typical American family, which many say we are. My family would never turn Nitro into Paris Hilton’s Tinkerbell, rather keep him simple. He can be simply stylin’ in a leather collar. 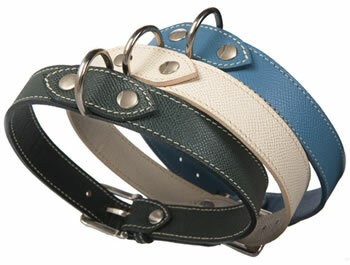 The Barney’s New York Palmellato Dog Collar is designed from grained leather and is available in a variety of colors. This way your simple pup can still show off his or her different moods. For example wear light orange on a sunshiny summer day or black when trying to be low key ;-). The collar measures 55 cm in length and is 2 1/2 cm wide. Choose from a variety of colors via Barney’s New York for $35. The Bella Paris Lucy Dog Carrier is a luxurious and simple accessory that will be chic for both you and your pet. The list of features on this bag are endless. To touch on a few of them: U shaped dual-zipper mesh roof for easy access and view of your pet, a dual zipper mesh door on one side for easy entrance and exit for your pet, an additional outside large zipper pocket personal items, a roll down window cover if you’d like to hide your precious pup (as in if your a celeb and your pup is having a bad hair day), a stiff body to maintain the structure, and the bag is approved by most airlines for your carry on. This carrier measures 16Ã¢â‚¬ÂL x 10Ã¢â‚¬ÂH x 8Ã¢â‚¬Â W. If you have been looking for a practical, sturdy, and chic pet carrier buy the Lucy carrier through Bella Paris for $110.